11 April 2017 – Life Is Such A Sweet Insanity. In a way it’s hard for me to believe that it’s only Tuesday. Outside of pilot stuff, I’ve scaled away from social media and news outlets, trying to find contentment in my own little world. However, once in a while I see what’s going on via Twitter or breaking news alerts on my phone and I’m just so dang confused about our part of the world. A man fatally shot a teacher, one of her students and himself, while also injuring another child in the process in San Bernardino, California yesterday, but this act of gun violence doesn’t seem to get a lot of attention on social media. It’s like the American public has become desensitized to gun violence in schools in the day and age in our country. Such a sad state of affairs. There’s a whole bunch of outrage about basically every wrong decision an airline can make when United Express forced “volunteers” off a flight from Chicago to Louisville to make room for United employees that needed to get to Louisville to work. There was screaming, chaos, resistance, police involvement, a passenger yanked out of his purchased seat, bonked against an armrest and then dragged down the aisle where he apparently, ten minutes later, gained access back to the aircraft, face covered in blood and wrapped himself around a post in the back of the airplane. He was removed again. I’m sick of this story, I’m sick of really stupid airlines and while I think United was completely in the wrong in this instance, the man should re-evaluate his ability to pick which battles to fight. I guess I place a lot of emphasis on personal dignity and self-respect. Then there’s a bunch of outrage this evening because Trump Administration Press Secretary Sean Spicer said something really stupid about Hitler and the holocaust, basically reducing it to some sort of unfortunate incident in the 20th century history books and now he’s apologizing and clarifying and doing the usual spin and twist of any typical Trump Administration official. No one seems to notice that whatever part of the timeline in the grand scheme of things that we are currently sitting on, this part of the timeline is completely on fire. Oh, and Trump is kind of picking fights with various other nuclear powers in the world, so I’ll be happy awaking each morning knowing that we weren’t wiped off the face of the planet by nukes in our sleep. I’m getting to the point to where I really can’t keep up with the news anymore. I can’t keep up with the real news, I can’t keep up with the idiocy going on in Washington and I certainly can’t keep up with the mass Pearl Clutching in progress every day over some new topic in which to engage in faux outrage. 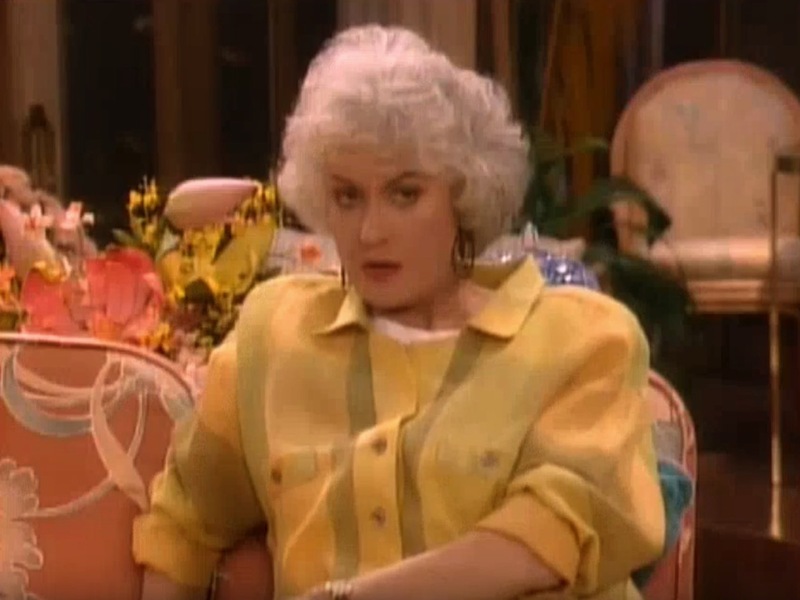 I feel just as confused as Dorothy when Sophia was made over to look like a 65-year old Drag Queen. I wish life was that simple again. I wish there was a laugh track. I guess we just need to keep looking for the bright side.